Donnez à vos photos une finition 100% analogique avec des émulations de films haut de gamme! 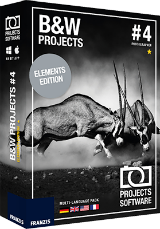 L'offre gratuite du jour pour Black&White projects 4 elements était valable le 13 juillet 2018! BLACK & WHITE projects 4 est l'outil parfait pour permettre à tous les photographes ayant une affinité particulière pour les photos en noir et blanc de faire leur marque créative. Le nouveau moteur de sensibilité spectrale vous permet de saisir la valeur de gris pour chaque couleur convertie et de la personnaliser à n'importe quelle valeur de tonalité. Les 80 préréglages fabriqués à la main vous offrent une pléthore d'options à partir des informations cachées de vos images. Donnez à votre image une finition 100% analogique avec des émulations de films haut de gamme adaptées des classiques comme Ilford, Kodak, Rollei et Fuji. Des expressions fortes, même avec des situations d'éclairage difficiles. Mode RAW et les fonctions RAW avancées et ainsi de suite..
Prix spécial pour les utilisateurs de GOTD: obtenez des projets BLACK & WHITE 4 pour seulement $ 25.00 au lieu de $ 99.00! If you have a version of SILVER Projects and are wondering: BLACK & WHITE Projects is the same program. It is the version number that matters. It is just that Franzis has a rather tricky naming policy. Depriving a photo of all its colors is not a natural step to take for someone who considers colors to be the joy of life. On the contrary, the first reflex is to boost (often unreasonably) saturation, contrast etc., which explains the incredible hues all sunsets and forests have these days - at least virtually. Still, if you venture to give it a try, you might find out that far from dulling your photos, removing their colors might make them more intense and evocative, as if too many fancy colors were a distraction. And if you think that just setting the saturation slider at 0 in any image editor will do the trick, you will be in shock the first time you load a photo in Franzis B&W Projects! Paradoxically, it seems that there can be more differences between two B&W versions of the same photo than between two colored ones. Depending on the tone conversion (you tube video here: https://www.youtube.com/watch?v=ARL1AUwCCLY ) you will create entirely different atmospheres. Of course you can also, like in any image editor, modify contrast, brightness, blurring etc. And if you are a bit shy with that kind of software, you will just be happy with the 118 presets as they are. 5/ For a more natural look slightly blur the edges of the color parts with a narrow brush, save and voilà! Photo n° 03 is a montage. All photos are scans of analog photos. They were shot at a time when shooting in color or in B&W was an irreversible decision, at least until I had taken the 24 or 36 photos allowed by my film roll (I suspect a good half of GOTDers here today have no idea what I am talking about). Nowadays, you don't have to chose in advance or even later on, you can have as many versions of a given photo as you wish, so give yourself the chance to find out that black and white is beautiful too. 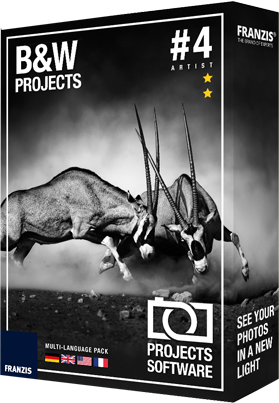 The same version of BLACK & WHITE Projects elements has already been offered here last year: https://www.giveawayoftheday.com/black-white-projects-4-elements/ If you have a version of SILVER Projects and are wondering: BLACK & WHITE Projects is the same program. It is the version number that matters. It is just that Franzis has a rather tricky naming policy. Admittedly, Franzis doesn't offer us the most straightforward installation/registration process, but if you are already registered on their site, you will be spared a few steps. To help: 1/ On the registration page, if you can't find a button to click, scroll down; 2/ If you don't read carefully their last email (yes, there might be several), you are likely to come and complain here that, to activate the program, you are asked a serial number which you never received. Hint: just re-enter the registration code you needed to start the installation. Same code under two different names Depriving a photo of all its colors is not a natural step to take for someone who considers colors to be the joy of life. On the contrary, the first reflex is to boost (often unreasonably) saturation, contrast etc., which explains the incredible hues all sunsets and forests have these days - at least virtually. Still, if you venture to give it a try, you might find out that far from dulling your photos, removing their colors might make them more intense and evocative, as if too many fancy colors were a distraction. And if you think that just setting the saturation slider at 0 in any image editor will do the trick, you will be in shock the first time you load a photo in Franzis B&W Projects! Paradoxically, it seems that there can be more differences between two B&W versions of the same photo than between two colored ones. Depending on the tone conversion (you tube video here: https://www.youtube.com/watch?v=ARL1AUwCCLY ) you will create entirely different atmospheres. Of course you can also, like in any image editor, modify contrast, brightness, blurring etc. And if you are a bit shy with that kind of software, you will just be happy with the 118 presets as they are. If the idea of banning all colors from your photos is too painful, you can create a sort of faux B&W by retaining a tiny percentage of them (slider bottom right), or a higher percentage if you like the faded look of ancient postcards (like what you can also get in ANALOG Projects, another Franzis program). You can also retain a specific color selectively or, using another soft subsequently, leave some elements that you want to emphasize brightly or slightly colored. A primitive but easy way of achieving it: 1/ In an image editor supporting layers, paste the B&W photo over the original colored one; 2/ On the top B&W layer carefully erase the parts you want to show in color; 3/ On the bottom color layer, adjust, if necessary, saturation, hue etc. to your liking; 4/ Merge the two layers; 5/ For a more natural look slightly blur the edges of the color parts with a narrow brush, save and voilà! To keep this post as short as possible, rather than copy and paste, I will refer you to my comment about ANALOG Projects if you want some clues about the interface (and Franzis' peculiar terminology), as most programs of this company share the same one: https://www.giveawayoftheday.com/analog-projects-3/ (post #4) Here: http://galerie.archive-host.com/n/index.php?id=JgVsQecLcgoIixe63hos you can have a look at 12 animated GIFs (created online on the site https://ezgif.com) showing some of my photos 1st/color 2nd/ B&W (all created with Franzis B&W Projects) and sometimes 3rd/ after reintroduction of color in some parts with another image editor. (Click a thumbnail to enlarge, then click again to animate.) Photo n° 03 is a montage. All photos are scans of analog photos. They were shot at a time when shooting in color or in B&W was an irreversible decision, at least until I had taken the 24 or 36 photos allowed by my film roll (I suspect a good half of GOTDers here today have no idea what I am talking about). Nowadays, you don't have to chose in advance or even later on, you can have as many versions of a given photo as you wish, so give yourself the chance to find out that black and white is beautiful too. No problem getting download or emails, software installed and registered without a problem. The registration process is bulky, but worth it for what looks like an excellent piece of software. It's easy to use and the end result is impressive. I'm very much into color, but now have a way to broaden my interests. Very generous giveaway. Thanks to Franzis and GOTD. Can't understand why many people have problems. For me, it downloaded, installed and activated smoothly after following the readme instructions. Also take note of ouialaraison's helpul post. Windows 10 Pro, 64 bit, 8 GB ram, 4-core CPU, Nvidia quadro k420 graphics. Can't understand why many people have problems. For me, it downloaded, installed and activated smoothly after following the readme instructions. Also take note of ouialaraison's helpul post. Windows 10 Pro, 64 bit, 8 GB ram, 4-core CPU, Nvidia quadro k420 graphics.